Why is this time of year different from all other times of year? Because this is the one time when the interests of observant Jews and the interests of serious foodies—and especially Coca-Cola fans—converge. That's because the Jewish holiday of Passover is once again upon us. During Passover, Jews are forbidden to eat a category of grains known as kitniot, which includes corn. The Ashkenazi rabbis who came up with this stricture many centuries ago probably didn't foresee how their edict would collide with the invention of high fructose corn syrup (or maybe they did—they were pretty smart dudes). But the end result today is that there are all sorts of HFCS-sweetened products that are kosher for most of the year but are not kosher during Passover. In some cases, special Passover editions of these products—sweetened with cane sugar, which is Passover-sanctioned, instead of HFCS—appear on the market in the weeks leading up to the holiday. And chief among these products is Coca-Cola. Coke, of course, used to be made with cane sugar. But as with most American sodas and countless other processed foods, the sugar was replaced by HFCS after the latter's rise to prominence in the late 1970s. So Passover is when Coke gets back to its sucrose roots, so to speak. 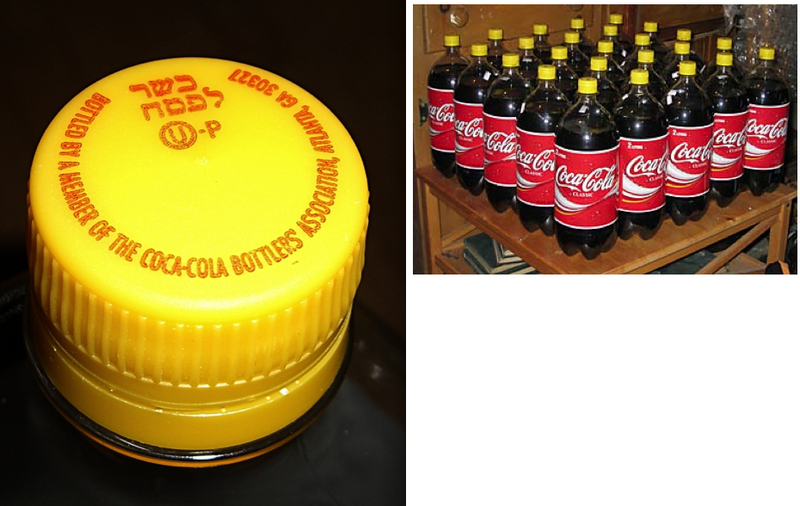 The sugar-sweetened version, which is distributed in areas with significant Jewish populations, is easy to spot: Just look for the yellow caps. The reason for Passover Coke's popularity among the gastronomic elite: People think it tastes better. The thing is, many of the people buying Passover Coke aren't Jews. They're goyim food geeks who prefer sugar over HFCS and snap up the Passover Coke as soon as it hits the stores each spring. (Mexican Coke, which is still made with sugar, can sometimes be found in America, albeit at a significant markup. It enjoys a similarly rarefied status in the foodie-verse.) One reason for this is that HFCS has become a sort of all-purpose bogeyman for the Michael Pollan wing of the foodie set, handily symbolizing a host of societal ills including obesity, corporate chicanery, synthetic foodstuffs, misguided farm subsidy policies, and so on. The other reason for Passover Coke's popularity among the gastronomic elite is much more straightforward: People think it tastes better. But does it really? This seems like one of those food-fetishisms that sound good on a blog but might fall flat in the real world. And besides, the Coke folks have always claimed that there's no flavor difference. In an admittedly unscientific attempt to settle the matter, two bottles of Coca-Cola were recently purchased and refrigerated —a standard, HFCS-sweetened bottle and a sugar-sweetened, yellow-capped Passover bottle. A small but expert tasting panel was convened, consisting of this columnist and one of his acquaintances, who we'll call the Cokehead (in part because she likes Coca-Cola but mainly because it's fun to call her that). Soda from each bottle was decanted into identical glasses, each of which had been stocked with a single ice cube. Each member of the tasting panel then administered a blind taste to the other. The Cokehead sampled both glasses and offered the following stream of commentary: "Oh! This one's stickier. Like, I can feel it on my teeth! It's richer. ... This other one is less substantial. It has a thinner quality to it. I think the first one, the richer one, that's the one with the sugar, right?" The Cokehead was, in fact, correct. The other member of the tasting panel also correctly identified the sugar-sweetened sample (although the purity of his response may have been corrupted by his exposure to the Cokehead's feedback). So the verdict appears to be that Passover Coke really is better. A simple case of superior ingredients yielding superior results, or further evidence of Jews being the chosen people? You be the judge, boychik. Do you know of a new product, service, design, or phenomenon that deserves a closer look? Send tips, samples, press releases, and best intentions here. Meanwhile, follow One-Man Focus Group on Twitter.